A Bird welcome mat with the White Crimson Morning Cardinals design. This decorative 27 x 18 inch by 1/8 inch thick door mat features a latex non-skid coating on the back with black fabric piping around the edges of the mat. The welcome mat can be personalized with a name or phrase for an additional charge. 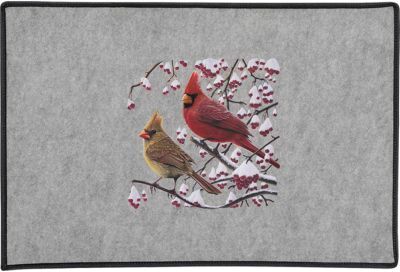 Greet all your guests with this White Crimson Morning Cardinals door mat! Approximate image size is 10.5x14.5 inches. Note: Image colors may appear more muted on final product due to mat texture. NOTE - Personalized products are non-refundable. If you've selected the option to personalize your item, enter the text here. You have 30 characters left. Do not use HTML. Enjoy the White Crimson Morning Cardinals design heat pressed on this light-weight, low pile,woven polyester door mat. This decorative welcome mat measures 27 x 18 inches, is 1/8 inch thick and features a non-skid latex coating on the back with black fabric piping around the edges of the mat. The mat can be personalized with a name or phrase for an additional charge. A great GIFT idea! To keep your White Crimson Morning Cardinals door mat looking great longer, we recommend Scotchguarding before use, and spot cleaning as necessary. Specifications: The welcome mat fabric is an 8 ounce woven polyester blend fabric with non-skid latex backing. The image size, color and placement on mat may vary from image shown depending on image size, mat color and whether a personalization option is chosen. In some cases, image colors may not be as vibrant as depicted on the web, due to fabric texture and web display limitations. Personalized mats are non-refundable. Mats are personalized with heat pressed vinyl lettering. Made in the USA.